Kefir is a unique, cultured dairy product that is one of the most probiotic-rich foods with incredible medicinal benefits for healing. For centuries, cultures have pickled and fermented foods to preserve them. By doing so, they created food that contained healthy microorganisms or probiotics that helped them to live healthy, long lives. Research has proven that preserving foods creates healthy bacteria within them. Kefir is a unique, cultured dairy product that is one of the most probiotic-rich foods with incredible medicinal benefits for healing. 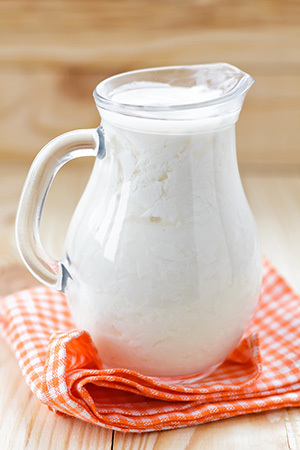 It is a fermented product that is made from cow, goat or sheep milk and tastes like a drinkable yogurt. Its unique name comes from the Turkish word “keif,” which means “good feeling.” It has been used in European and Asian folk medicine for centuries and contains high levels of vitamins B12 and K2, biotin, folate, calcium, magnesium, enzymes and probiotics. Because of its unique set of nutrients, kefir can boost immunity, heal inflammatory bowel disease, build bone density, fight allergies, improve lactose digestion, kill candida and support detoxification. With more than 75 percent of the immune system located in the digestive system, probiotics create trillions of good bacteria and fungus that kill the bad microorganisms to keep us alive and well. Remember, if we cannot absorb the nutrients in our food because of a lack of proper bacteria balance in the gut, the body will never run on all cylinders because it lacks the fuel. Today we live in an antibacterial society, full of hand sanitizers, soaps, lotions and cleaning products that kill bacteria. And do not forget the antibiotics, which also affect the gut and the immune system. Adding kefir to your diet is a great way to help the body replenish the good bacteria, and it tastes good, too.